This week’s blog is from our newest volunteer, Danai. My name is Danai and I am a conservation technician from Greece. I have lived in the UK for the past five years, and this is my first time volunteering here. 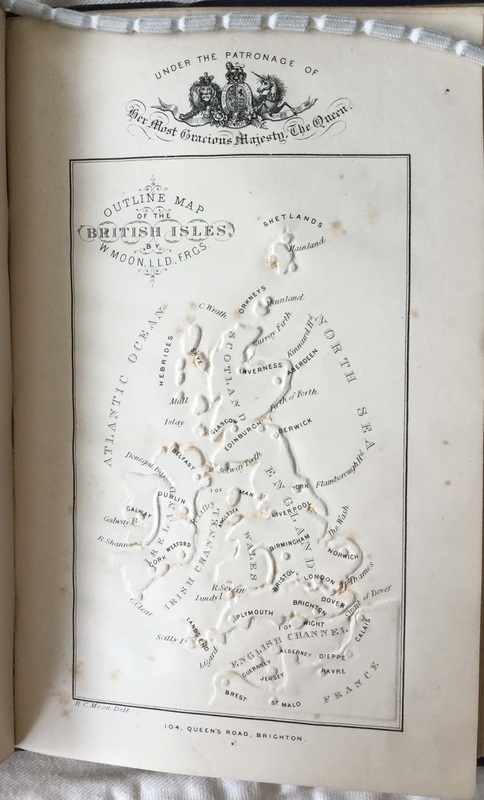 I moved to Edinburgh because I want to learn more about the history and heritage of Scotland, and I now volunteer in the Conservation Studio at the Centre for Research Collections, University of Edinburgh, treating heath archive material in particular. In the past, I have worked with, and conserved, many different materials and objects, and have also spent time as an exhibition assistant, where my main responsibilities were the correct packing and storage of items. 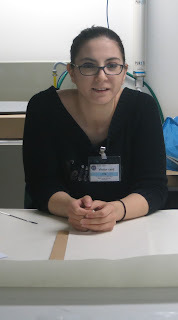 I hope to extend my experience through volunteering at the University, and to meet new people. My volunteer role is to treat and rehouse loose sheet material and I have been removing metal fasteners (see the picture below of all the fasteners that have been removed so that they don’t damage the paper), unfolding creases, surface cleaning, placing papers in new, labelled, folders and then putting those folders in boxes. I have already learnt a lot about how to care for archive material. This is very important to me as it is a completely new field, and with the help of conservation and archive staff here I am extending my knowledge to the next level. Once my current work is complete I am hoping to move on to new projects and learn more. This Friday’s blog comes to you from Ruth, the LHSA Manager. I originally trained as a fine art conservator, and as a manager of an archive I draw on that training when we repair individual items as well as when providing wider collections care for all the material in LHSA. The foundation for making sure that collections care is appropriate and to the highest standard possible is in knowing what you have in your collections, what those collections are made of and, therefore, what they may be particularly vulnerable to so you can work to ensure their stability for the future. We got a brief introduction into the science behind the equipment – x-rays displace inner shell electrons in the object you are analysing and that displacement is measured to identify the element(s) present. Once you know what elements are there you can start to work out what the object is made of. And we got some practical demonstrations of this…. We started on something slightly less significant – an office mousemat! – and from there we moved on to some real collection items to see how we might use the equipment in practice. Scans of a bound volume with metal decoration showed that the metal was brass and therefore not likely to be a more modern addition, and scans of a flute showed that though it had been described as crystal when it had been originally manufactured and sold, there was no lead present, so we’ll have to describe it as a glass flute from here on! We do a lot of materials identification during the course of our work with rare and unique collections, and it was really interesting to see the options that such a sophisticated piece of equipment like this can offer. A couple of weeks ago, we were lucky enough to receive an invitation from our friends at the Royal National Institute for the Blind (RNIB) Scotland to attend an event at the Edinburgh International Book Festival with author Graeme Macrae Burnet. The event was a recording of a special edition of Connect Radio, RNIB's online radio station, based around talking books. We've worked with RNIB Scotland before as well as holding their archive. 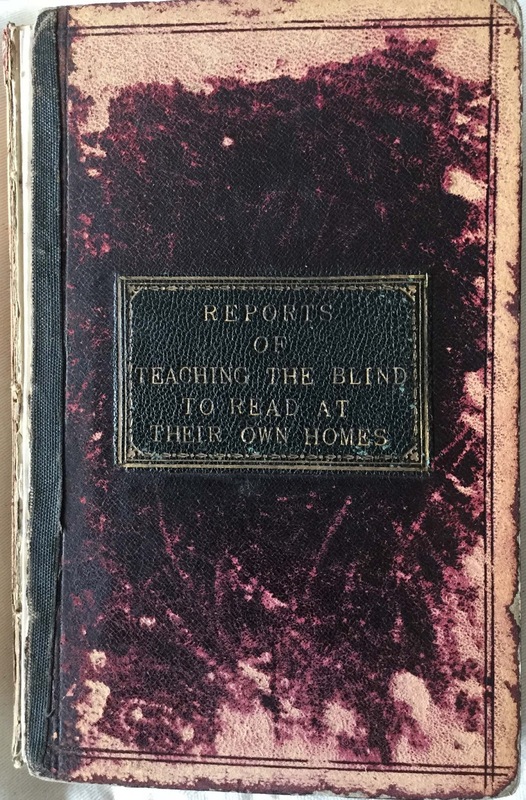 We've participated in their Seeing Our History project by indexing Edinburgh's Register of the Outdoor Blind from the beginning of the twentieth century, and also hosted researchers around the project. The interview was then followed by a panel discussion about how much having access to reading through RNIB has meant to individuals, both those born without sight, and those having to deal with progressive blindness. It brought home how reading in whatever form has the ability to lift people feeling isolated and alone, especially those coping with deteriorating vision. Reading can be a form of imaginative escapism and widening horizons, and blindness can limit access to those experiences, not to mention the possibility of being unable to participate in the way that books weave themselves into daily life and culture. 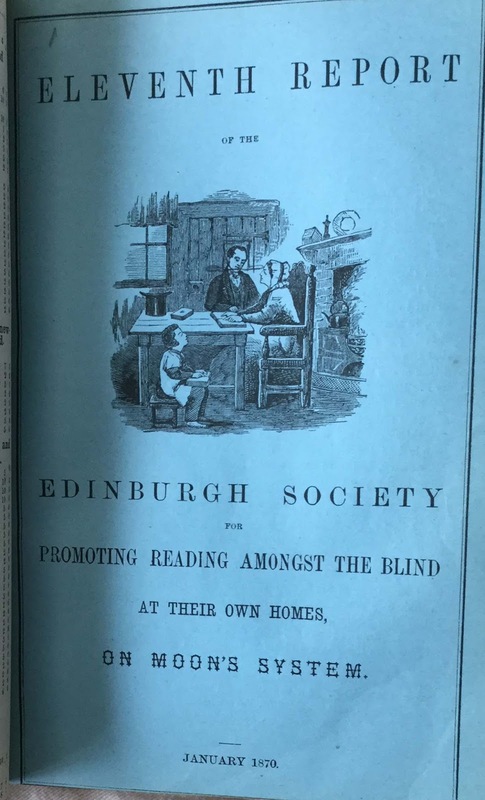 Attending the Book Festival event made me think of much earlier evidence about promoting access to reading reflected in the RNIB archive. 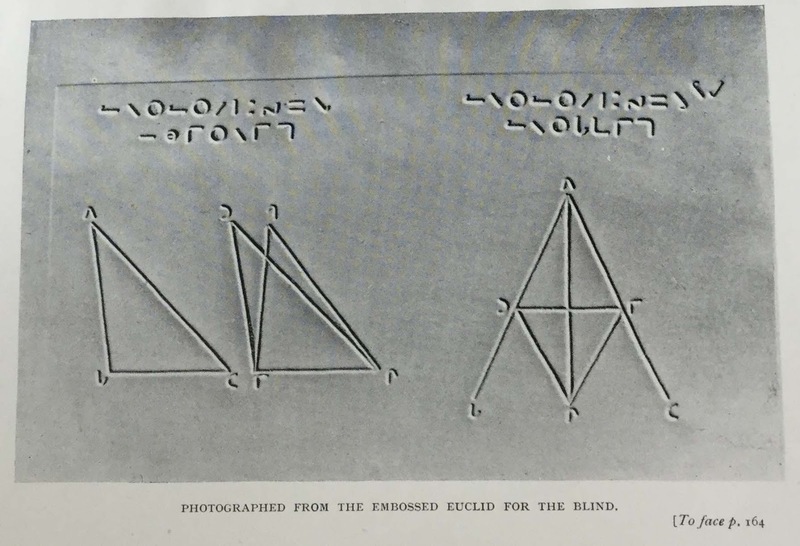 The earliest example that we have is Moon's Type. 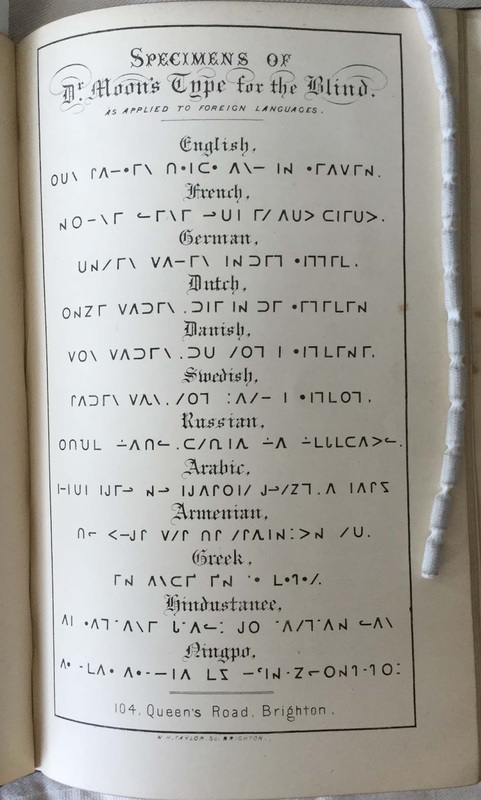 William Moon (1818-1894) invented a simplified system of raised type (the Braille system of dots is also raised type, more familiar to us now). Moon had lost the sight in one eye at aged four. 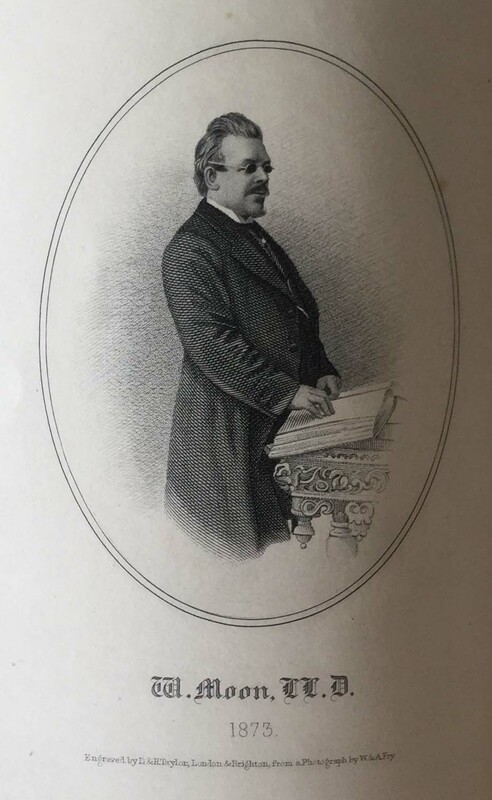 After leaving school his sight deteriorated until he was completely blind by aged 21, scuppering his ambitions to become a missionary. 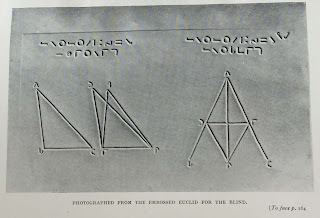 Following many failed experiments dating back to as early as the sixteenth century, raised type as a system of reading for the blind started to gain ground in late eighteenth century France. Moon himself mastered reading in raised type, but was distressed to find that some people could not. There would have been a couple of different versions at the time, including Lucas's Alphabet and Alston's Alphabet. Moon instead invented a simplified form of raised type alphabet, using fourteen different shapes at different angles. At first, Moon printed texts himself. 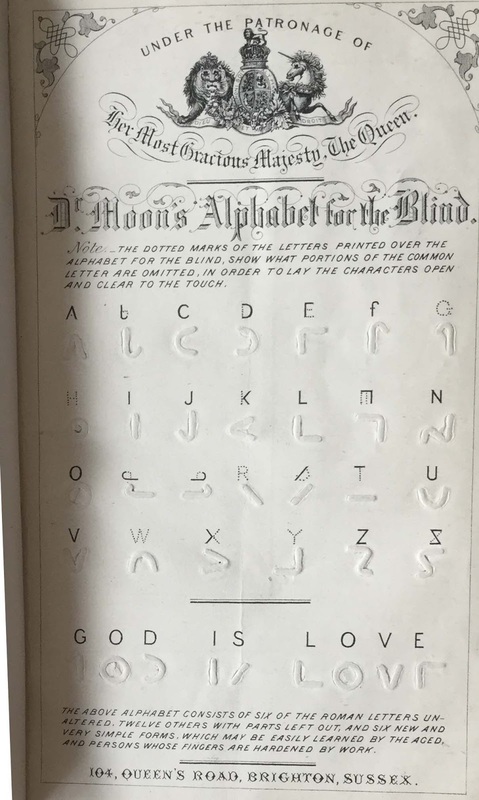 From the beginning, the invention of the type was tied into Moon's evangelical Christian faith - he wanted to bring scripture to those whose lack of sight meant that they couldn't read the Bible in conventional ways. 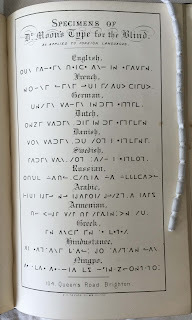 Moon's Alphabet was also adaptable to many different languages (particularly helpful to the travelling evangelical mission community), as shown below. 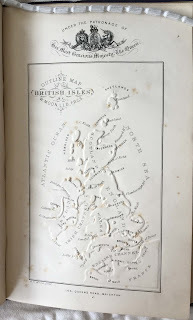 Helped by donations from wealthy patron Charles Lowther, Moon's system spread, and was received extremely favourably compared to previous, more complicated alphabets. 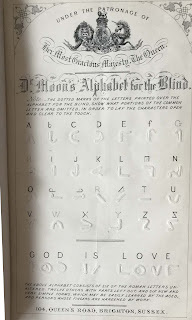 Moon also drove the rise of the Home Teaching Society initiative, where blind people would be encouraged to read in their own homes, spreading Moon's Alphabet to those outside the Blind Asylums (institutions to provide work and lodging to blind people). 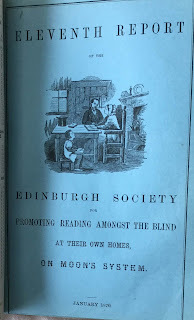 Edinburgh had a Home Teaching Society (founded in 1856), the Edinburgh Society for Promoting Reading Amongst the Blind at their Own Homes on Moon's System, reflected in the earliest reports we have in the RNIB collection. "The character is simple, easily felt and easily remembered. We are warranted in stating that individuals of any age can easily acquire a knowledge of it with the least possible trouble." The sheer variety of texts, formats and ways to consume reading (without being treated as an object of pity or potential vessel for conversion) offered by RNIB shows just how far reading for partially sighted people has come since the earliest examples we hold. If you're interested in helping more people with sight loss to access the lifeline of reading, you can learn how to sponsor a talking book here. In order to reform nursing and nurses training at the Royal Infirmary of Edinburgh (RIE), in the 1870s trained ‘Nightingale Nurses’ were recruited and a training program instituted. Under this new system, the nurses reported to the Lady Superintendent of Nurses, rather than individual ward doctors. In addition to the Lady Superintendent there was the Night Superintendent, who monitored staff and patients throughout the night. As there was little cross-over in their hours, the two used small bound notebooks as a means of communication between night shift and day shift. 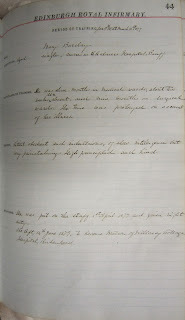 The left-hand pages of each book contains instructions recorded by the Lady Superintendent at the end of her day; and on the corresponding page the Night Superintendent would record the happenings of the night). Lady Superintendent: “The mother of the child in 3 S[urgical] is staying with him tonight so Nurse Black is not there”. Night Superintendent: “The boy has had a quiet night; he is always much better with his mother”. The job of nurse was a risky one; often, the Superintendents’ notes to each other either request or provide details about unwell colleagues. There are numerable instances of nurses falling ill, and and Mary Anne Barclay is one such nurse. Mary Barclay entered the RIE as a probationer on 19th January 1876 having previously been employed for a time at Chalmers Hospital in Banff. According to her training record, she spent three months working in the Infirmary’s medical wards before she fell ill. Her recovery was slow but ultimately successful, with her training record noting that she was “about ten weeks absent” before continuing her training with “nine months in surgical wards”. Ultimately, her hard work and commitment to the vocation paid off. She was described as “patient, obedient and industrious, of slow intelligence but very painstaking, high principled and kind”, and after two years working on the night staff of the RIE she left to take up the post of Matron of Wallasey Cottage Hospital in Birkenhead. Although intended as administrative records, these volumes are a wonderful way to experience more of life on the ward, and the nurses’ concern for their patients really comes through.